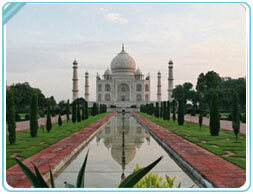 Read about how to reach Agra, reaching Agra, traveling to Agra etc. Agra is easily accessible, especially from Delhi and Jaipur. It has its own domestic airport, which is just 5 km from the city and also doubles up as the military airport. It is also well connected by a network of trains to almost all the major destinations throughout the country and some of the super-express trains that pass through it include the Rajdhani Express and the Shatabdi Express. Both the government and private buses and deluxe coaches run to and from Agra to all the nearby major destinations within and outside Uttar Pradesh. Agra's very own Kheria airport is barely 5 km from the city and is also known as Agra Civil Enclaves. All the major domestic airlines provide flight services to and from the city of Taj. It is surprising to note that Agra has seven railway stations of its own, excluding the Tundla junction, which is just 1 hour away from the city. However the two major railway stations include Agra Fort Railway Station and Agra Cantt Railway Station. Raja-ki-Mandi is also a popular stopover point in the city. Most of the trains running across India pass through the former two railway stations including the luxury train 'Palace on Wheels' and the super express trains known as Rajdhani Express and Shatabdi Express. Some of the other major trains pass through Tundla, well connected to the city by road. Agra boasts of three National Highways including N.H. No. 2, 3 and 11. The government and private bus services are available to and from Agra to all the nearby major destinations. One can hire ordinary buses or the deluxe coaches, according to their requirements. U.P. Tourism also conducts special guided tours for the tourists, who come here just for a day, including Taj Mahal, Agra Fort, Sikandra and Fatehpur Sikri in their itineraries.